In my early twenties, Jeff Tweedy’s morose, downtrodden, one-foot-in-the-grave rock was sad chic. The frontman of Wilco wasn’t enigmatic, but rather a bedraggled dude who wore his heart on the sleeve of his flannel. 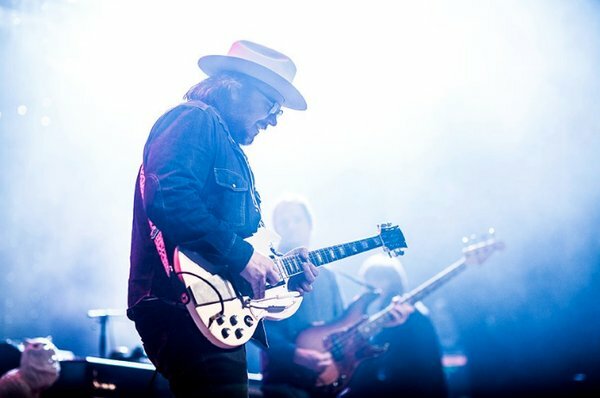 It was easy to poke fun at Tweedy’s bloodletting: “you can smoke at 18, drink at 21, and listen to Wilco at 35” I used to say. The pockets of pain in the band’s oeuvre were effective, playfully painful, and sometimes ridiculous in their theatrics – I’m referencing you, “Spiders (Kidsmoke)”. All of that hoarse baying. Everybody calm down. But Tweedy did write some great music in the aughts. “Handshake Drugs” is an essential song that brought me to my knees in Boston, way back in 2006. Few songwriters, particularly in an era before modern self-referential exploration, wrote lyrics with such searing, perceptive indictments of our emotional fault lines. The early 2000s were still a time of glamorous posturing in music, but Tweedy was eager to buck the fun in favor of overcast skies. It was…comforting. Wisdom in a wary voice. A band that felt both young and old at the same time. It was an attractive balancing act of wit, humility, and devastation. Music that suffered with you, like an eloquently punctuated LiveJournal entry by someone who knew how to publicly vent. Wilco didn’t feel pretentious, disingenuous, or goofy. They knew who they were, and you knew, too. Listening to “Jesus, etc” now, fourteen years after its release, makes me feel sadness, familiarity, appreciation, and confusion – all of the intended emotions that the band wanted to rack up on their skee ball score, I’m guessing. Starting with 2009’s “Wilco” the album, everything began to feel less curious and more apprehended by celebrity. Not to kick sand on Tweedy’s well deserved fame, but his music, around this time, started a downward trajectory of comfort and congratulatory contentedness. Something felt amiss, inorganic. Nathan Kowalski, our music contributor, liked the band’s latest record, “Star Wars”, so maybe I’m wrong. All these years later, Tweedy’s name has settled like dust into aughts history. His Twitter a scatterbrained mash of photos, album recommendations, and pictures of him dressing like a hybrid of Neil Young and Dinosaur Jr. frontman J. Mascis. We’re all getting old and I have no real way of addressing this situation other than to publicly lament it on an entertainment website. I am also left wondering if Jeff Tweedy is in Monsters of Folk or not. I could easy find the answer, but we, once again, went over our research budget. As much as I joke around about Wilco’s rocking chair sadness, the band is a good one. They evoke a time and a place, a feeling of frustration and despair (and, even briefly, elation). And these emotions washed over me so much last evening that I woke up today, checked my Facebook alerts, and found this comment on my wall referencing my late night liking of the Wilco page. Life is funny, Jeff Tweedy is funny, and all is sadness. Or something.